Challenging many of the conventions of pastoral counseling, Edwin H.Friedman shows how family theory points to a less stressful approach to the full range of the clergy's responsibilities. This bestselling book applies the concepts of systemic family therapy to the emotional life of congregations. 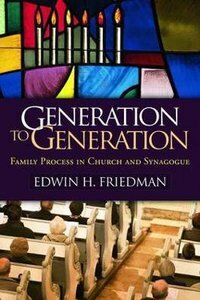 Edwin H. Friedman shows how the same understanding of family process that can aid clergy in their pastoral role also has important ramifications for negotiating congregational dynamics and functioning as an effective leader. Clergy from diverse denominations, as well as family therapists and counselors, have found that this book directly addresses the dilemmas and crises they encounter daily. It is widely used as a text in courses on pastoral care, leadership, and family systems. About "From Generation to Generation"